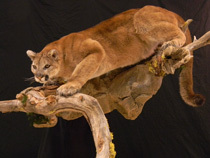 Our talented taxidermists, Walt and Carol Clemmens, have been doing taxidermy since 1979. We are a full-service taxidermy, mounting hunter's trophies from North America, Africa, New Zealand, and all over the world. Our taxidermists know how important your trophies are to you, so we specialize in custom, one of a kind mounts. Come in and see what we can do for your trophy. Quality has always been our number one goal. We use only the very best and most lifelike products in our mounts and regularly attend seminars and workshops to keep up on the latest in technology and knowledge in our field. In the end, however, the quality of any mount depends on the skill and talent of the taxidermist. We invite you to visit our showroom. Our work speaks for itself. We are experienced in all facets of taxidermy. Some of the services we offer include mounting game heads, life size mammals, birds, fish, rugs, cleaning skulls, and restorations of old mounts. If you are interested in having a showroom of your own, we can help you with the design and can build large showroom dioramas for you. If you are planning a hunt outside the U.S., contact us before you go. We can help you get the fastest shipping and custom clearing for your trophies.